The 15th-century Hôtel-Dieu, venue of the Hospices de Beaune wine auction. For Burgundy wine enthusiasts, a very important date is approaching with the 158th Hospices de Beaune wine auction which will be taking place on the 18th November 2018 in the historic town of Beaune in France. Many events take place over that weekend celebrating the wines and food of Burgundy including what the locals call “Les Trois Glorieuses”, three glorious events that take place annually on the third weekend of November. The first is a black-tie dinner on the Saturday evening at the spectacular Château du Clos Vougeot hosted by the Confrérie des Chevaliers du Tastevin. The second is the Hospices de Beaune wine auction held in the fifteenth century Hôtel-Dieu (more of which I will explain later). And the third is arguably the world’s finest BYOB lunch starting at midday on the Monday in the Château de Meursault, which is called the La Paulée de Meursault and invariably continues long into the evening. Legendary vintages of finest and rarest wines are opened and shared amongst the lucky attendees - many oenophiles consider this lunch a lifetime’s vinous highlight! I would highly recommend planning a visit to Beaune over this very special festive Hospices de Beaune weekend. The Hospices de Beaune is an atypical auction as rather than selling bottled wines, on sale are barrels of the recently harvested and just finished fermenting 2018 vintage wines. One is effectively buying futures or “vins primeurs”. Reports from Burgundy is that the 2018 vintage was an excellent year producing very well-balanced wines with significant ageing potential and in significant quantity, with over 800 barrels being offered for sale. The lucky buyers will have to wait another 12-24 months after the auction before they receive their bottles as the wine needs to mature and evolve in the French oak barrels, called barriques, which will be tended to by your chosen Burgundy producer. The great news is that the buyer will get 288 bottles of fine Burgundy, and even better news is that buyers can personalise the labels, which make ideal gifts and mementoes for special occasions such as births, weddings, or just to be able to serve your friends wines with your name on the label! Over the years, donations of Burgundy vineyards to the Hospices de Beaune have created a 61 hectare Domaine. Fifty different cuvées will be offered, both white Burgundy (made from Chardonnay) and red Burgundy (made from Pinot Noir) and at varying price points from the easy-drinking approachable wines, called ‘Village level’, such as Pouilly Fuissé and Puligny-Montrachet for whites and Pommard and Santenay for reds, to the more structured and age-worthy that will benefit from bottle ageing in your cellar, called Grand Cru wines such as Bâtard-Montrachet and Corton-Charlemagne for the whites and Echézeaux and Mazis-Chambertin for the reds. Bidding can easily be arranged through Christie’s, who have been running the auction since 2005. 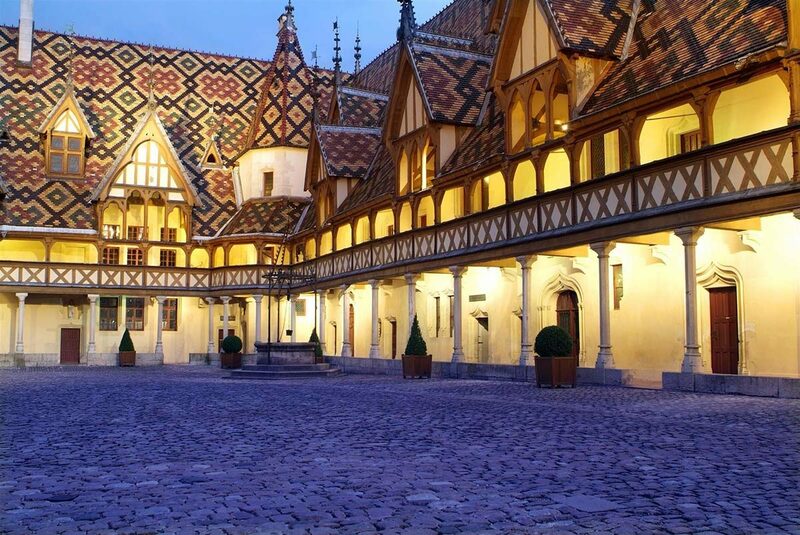 The Hospices de Beaune is a charitable sale with the proceeds from the wine auction going towards a vital local hospital, the upkeep of historical monuments in the town and to operate the vineyards and winery at the Domaine. So not only are you securing fantastic wines, you are also supporting a great charitable cause. Burgundy wines are extremely popular and in high demand, and this auction offers lucky buyers a chance to secure these rare wines. Buyers can also choose the bottling format, so instead of getting 288 bottles (24 cases of 12 bottles), you could choose 144 magnums (1.5 litres) or 72 jeroboams (3 litres), which should be enough for that special party of the century! It may seem like a lot of wine, but bottles are soon drunk and shared with friends and family and almost all previous buyers that I have spoken to have always regretted not buying more barrels, as when the bottles are gone….they are gone! Santé! For more information on how to participate in the Hospices de Beaune auction, visit Christie’s and register to bid.